October 2013 marked five years since our award winning community archaeology project began, with a generous three year grant from the Heritage Lottery Fund. 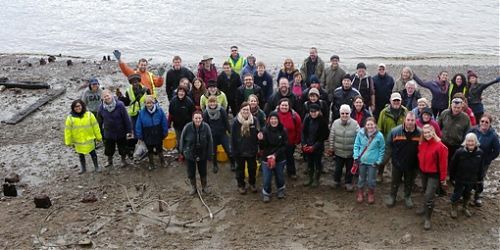 The Thames Discovery Programme is a hugely successful project, providing access to archaeology and leading efforts to record the longest archaeological site in the UK: the Thames foreshore. • Discovered London’s oldest structure at Vauxhall, evidence for Bronze Age flint-knapping at Bermondsey, 10 Anglo-Saxon fish traps, medieval jetties at the Tower of London and Greenwich, the remains of the HMS Duke of Wellington in Charlton, the largest warship in the world when launched and, the launching slips for Brunel’s SS Great Eastern, the largest ship in the world when launched. The project, hosted by MOLA (Museum of London Archaeology), is well established in the sector as a pioneering and positive initiative. The TDP is continually developing foreshore recording and monitoring methodologies; in advance of increasingly severe riverine erosion, providing education and training opportunities and hosting a vibrant public archaeology and outreach programme. The FROG teams are now well established across London, undertaking vital monitoring of these fragile archaeological sites.